Mortgage markets were mostly unchanged last week for the second straight week. Spain made few moves to allay concerns from its investors, the Federal Reserve did little to change its message on the U.S. economy, and newly-released economic data was in-line with expectations. Conforming mortgage rates in California idled last week, remaining near all-time lows for the 30-year fixed rate mortgage, the 15-year fixed rate mortgage; and the 5-year ARM. A discount point is a one-time closing cost and is equal to one percent of your overall loan size. This means that a mortgage applicant with a $100,000 mortgage and an accompanying 0.7 discount points would be responsible for paying an upfront charge of $700 at the time of closing. Freddie Mac’s mortgage rates assume full closing costs, too. This week, it’s unclear whether Rancho Santa Margarita mortgage rates will rise or fall. There are few economic data points due for release so mortgage markets are expected to take their cues from Europe where there’s no shortage of story lines. In Spain, there are protests over new austerity measures. In France, a new President may be elected — one whom opposes austerity. In the Netherlands, a new budget passed that includes austerity measures, but barely. Each storyline generates uncertainty about the future of Europe and its unified economy. As the uncertainty grows, global investors seek safety in the U.S. mrotgage bond market, a move that helps mortgage rate shoppers. When demand for mortgage bonds is high, mortgage rates tend to improve. Also affecting mortgage rates this week will be Friday’s Non-Farm Payrolls report. The economy is expected to have added 165,000 net new jobs in April and the Unemployment Rate is believed to have remained unchanged at 8.2%. If there is a deviation from either of these expectations, mortgage rates will change. If the actual jobs data is stronger than Wall Street expectations, mortgage rates are likely to rise. If the jobs report is weak, mortgage rates should fall. To home buyers and sellers throughout California , this is statistically significant because the Pending Home Sales Index is normalized to 100, a value corresponding to the average home contract activity in 2001, the index’s first year of existence. 2001 was an historically-strong year for the housing market. Immediately following the FOMC’s statement, mortgage markets improved slightly, pressuring mortgage rates lower in Coto de Caza and nationwide. Based on Census Bureau data, the number of new, single-family homes sold in March slipped 7 percent from February — the largest one-month drop in more than a year. On a seasonally-adjusted, annualized basis, buyers in California and nationwide purchased 328,000 newly-built homes last month. The decrease in sales from February to March can be attributed, in part, though, to a massive upward revision in February’s figures. Last month, the Census Bureau had reported 313,000 new home sales in February on a seasonally-adjusted, annualized basis. This month, those sales were re-measured to be 353,000 — an increase of 13 percent. 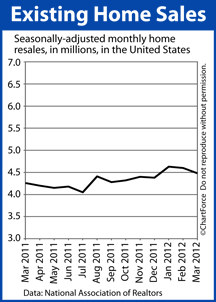 January’s sales were revised higher, too. The long-term trend in the market for new homes remains “up”. This is no more apparent than when we look at the available new home inventory. At the close of March, just 144,000 new homes were available for purchase, down 2,000 from the month prior and representing the most sparse new home housing supply since at least 1993, the year that the Census Bureau starting tracking such data. At the current pace of sales, the new home housing stock would be sold out in 5.3 months. A six-month supply is believed to represent a market in balance. For new home buyers in Rancho Santa Margarita , March’s New Home Sales report does not represent a housing market pull-back. It may represent opportunity, however. 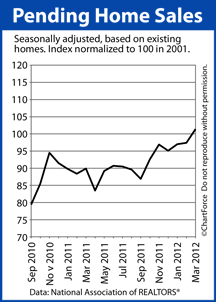 From October 2011 to February 2012, housing data was uniformly strong. Home sales were higher, home supplies were lower, and confidence was rising. In March, it was the reverse. This is normal because growth is rarely linear. In any market, it’s a few steps forward and a single step back, and housing is likely showing a similar pattern. With mortgage rates still low and builder confidence down, it’s a terrific time to shop new construction. There are deals to be found for buyers who seek them out. The Federal Open Market Committee begins a 2-day meeting today in the nation’s capitol. It’s the group’s third of 8 scheduled meetings this year. Mortgage rates are expected to change upon the Fed’s adjournment. 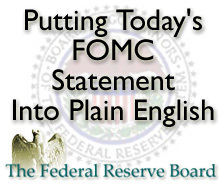 Led by Chairman Ben Bernanke, the FOMC is a 12-person, Federal Reserve sub-committee. The FOMC is the group within the Fed which votes on U.S. monetary policy. “Making monetary policy” can mean a lot of things, and the action for which the FOMC is most well-known is its setting of the Fed Funds Funds. The Fed Funds Rate is the overnight interest rate at which banks borrow money from each other. It’s one of many interest rates set by the Fed. However, one series of interest rates not set by the Fed is mortgage rates. Instead, mortgage rates are based on the prices of mortgage-backed bonds and bonds are bought and sold on Wall Street. There is little historical correlation between the Fed Funds Rate and the common, 30-year fixed rate mortgage rate. 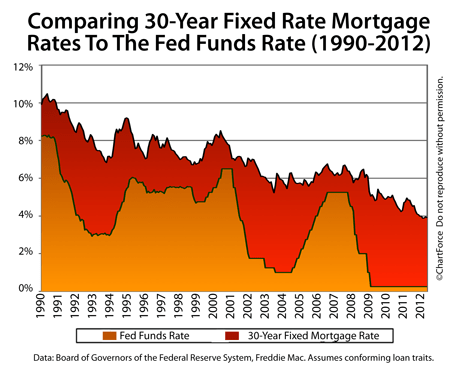 As the chart at top shows, since 1990, the Fed Funds Rate and the 30-year fixed rate mortgage rate have followed different paths. Sometimes, they’ve moved in the same direction. Sometimes, they’ve moved in opposite directions. They’ve been separated by as much as 5.29 percent at times, and have been as near to each other as 0.52 percent. Today, that spread is roughly 3.65 percent. It’s expected to change beginning 12:30 PM ET Wednesday. That’s when the FOMC will adjourn from its meeting and release its public statement to the markets. The FOMC is expected to announce no change in the Fed Funds Rate, holding the benchmark rate within in its current target range of 0.000-0.250%. 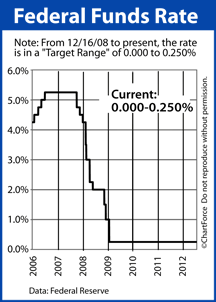 However, how mortgage rates in and around Trabuco Canyon respond will depend on the verbiage of the FOMC statement. In general, if the Fed acknowledges that the U.S. economy as in expansion; growing from job growth and consumer spending, mortgage rates are expected to rise. If the Fed shows concern about domestic and global economic growth, mortgage rates are expected to fall. 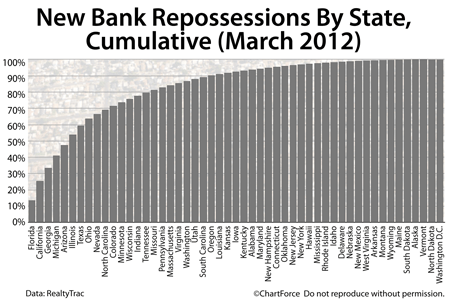 Any time that mortgage markets are expected to move, a safe play is to stop shopping your rate and start locking it. Today may be one of those times. 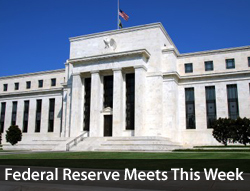 Comments Off on The Fed Starts A 2-Day Meeting Today. Make A Strategy. Conforming mortgage rates across California rose slightly according to the weekly Freddie Mac Primary Mortgage Market Survey. By extension, therefore, the Federal Reserve’s statement has the power to move mortgage rates in and around Coto de Caza. For Coto de Caza home buyers, today’s foreclosure market represents an interesting opportunity. 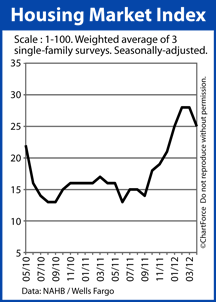 Tuesday, the government released its March 2012 New Residential Construction report. The report is made up of three sections, each related to a phase of the “new home” market. The report’s first part is Building Permits; the second is Housing Starts; the third is Housing Completions. Of the three sections, it’s Housing Starts that gets the most attention from the press — mostly because, of the triad, it’s the simplest for a layperson to understand. However, the manner in which Housing Starts data is reported can be misleading. Today’s newspapers offer up an excellent example. 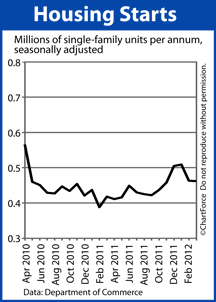 According to the Census Bureau, total Housing Starts fell by 6% in March as compared to the month prior. 654,000 units were started on a seasonally-adjusted annualized basis. For Housing Starts, it’s the lowest reading in 5 months, a statistic suggesting that the housing market may have lost some momentum. Much of the press covered the story from a “housing is slowing” angle. Although these headlines are accurate, they tell just half of the story. Housing Starts did drop in March, but if we remove a subset of the data — structures with “5 or more units”; a grouping that includes condominiums and apartment buildings — we’re left with Housing Starts for single-family residences only. It’s this data that matters most to buyers in Coto de Caza and nationwide. Few home buyers buy entire apartment buildings. Most buy single-family homes. That’s hardly a drop at all. At first glance, the data reveals a weakening market for newly-built homes and this may be true; we won’t know for another few months whether April’s confidence setback is an historical blip or the start of a trend. The change in builder psyche, though, is a change that today’s new home buyers in Coto de Caza can exploit.